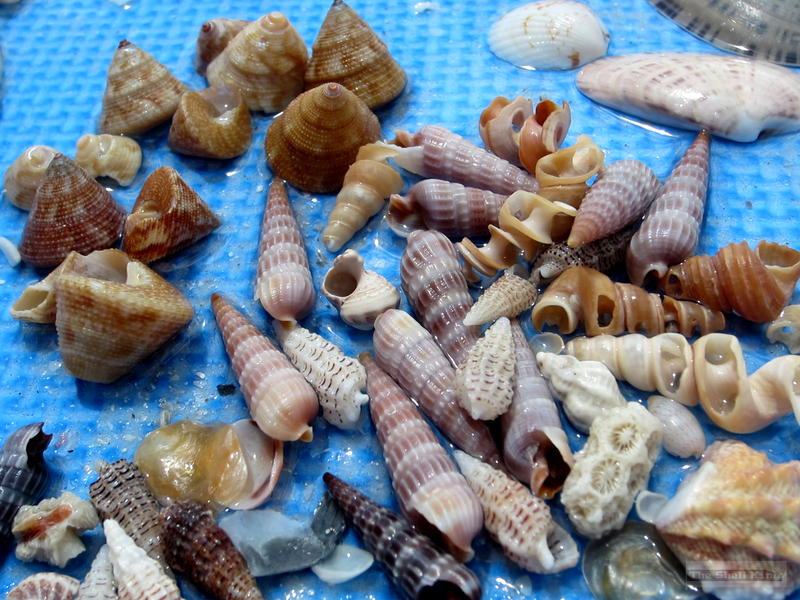 We knew it wasn’t going to be a great night for shelling. The sky was overcast and we discussed our shelling window on the way over the causeway. Now, I’m really not one to follow the tide charts or wind patterns. Every once in a while I’ll lick my finger and stick it in the air. But that’s only to make people think I know what I’m doing. I just like the ocean. I like to go to the beach. I like sand. Makes me feel good. 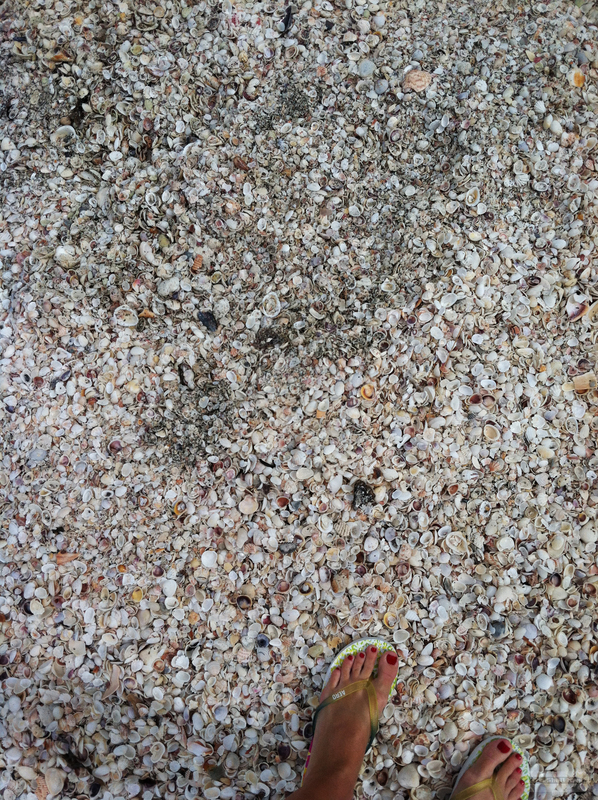 If there aren’t shells to be had, it’s still the beach and I’m still glad to be there. 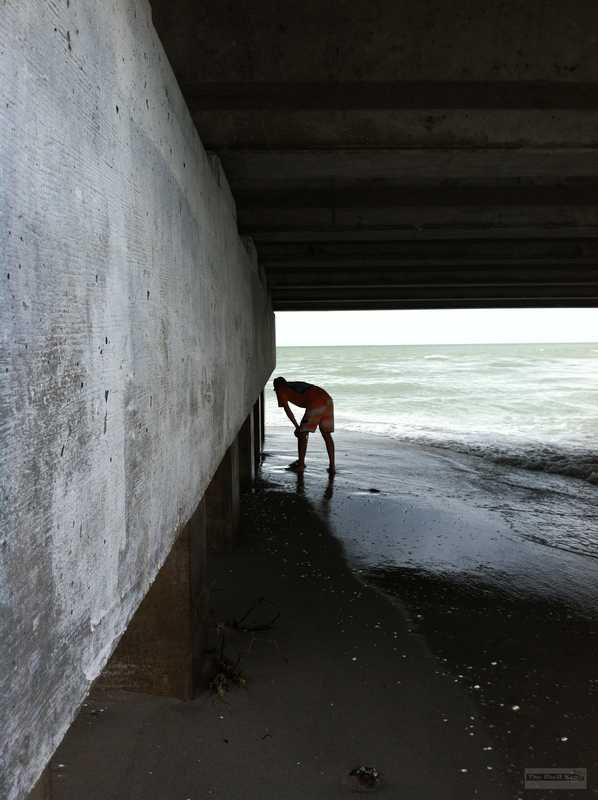 Although the pictures don’t show it, the water was pretty rough when we ended up at Blind Pass last night around 5pm. 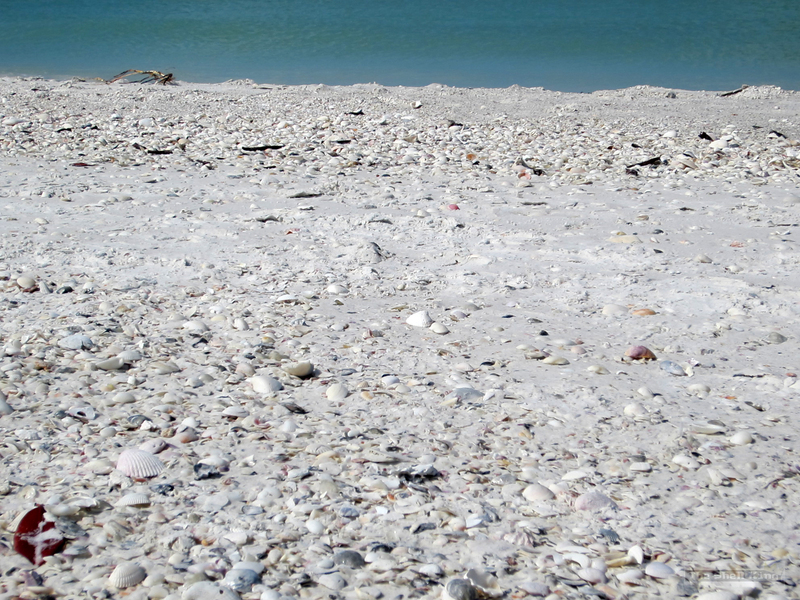 We tried the Captiva side first and there was a smallish shell pile. 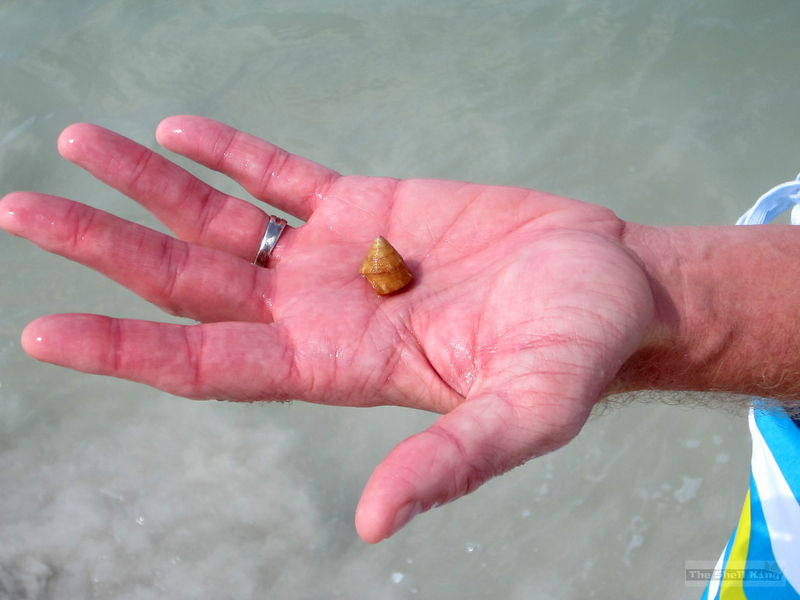 Queenie checked that out and found a few nice shells while I hit the shore to see if there were any goodies. 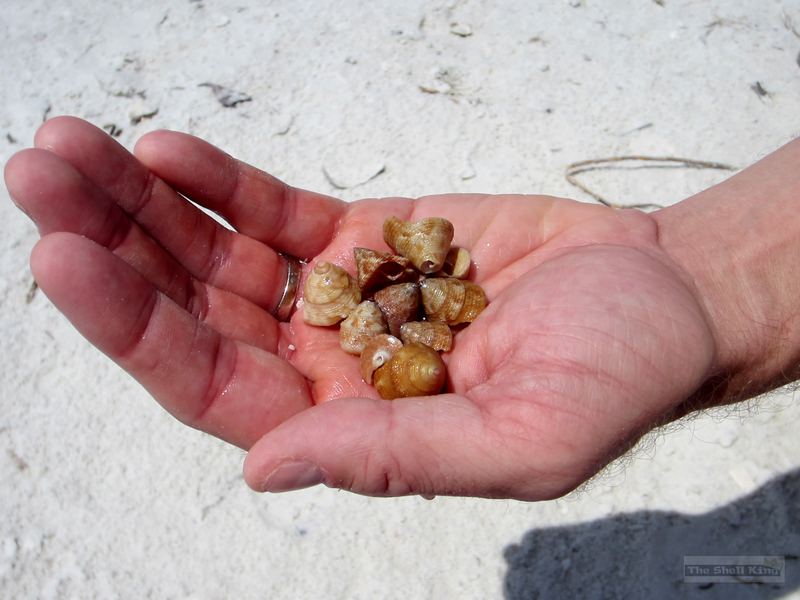 The wrack was pretty full and I scoured that, snatching up a few orange scallops. 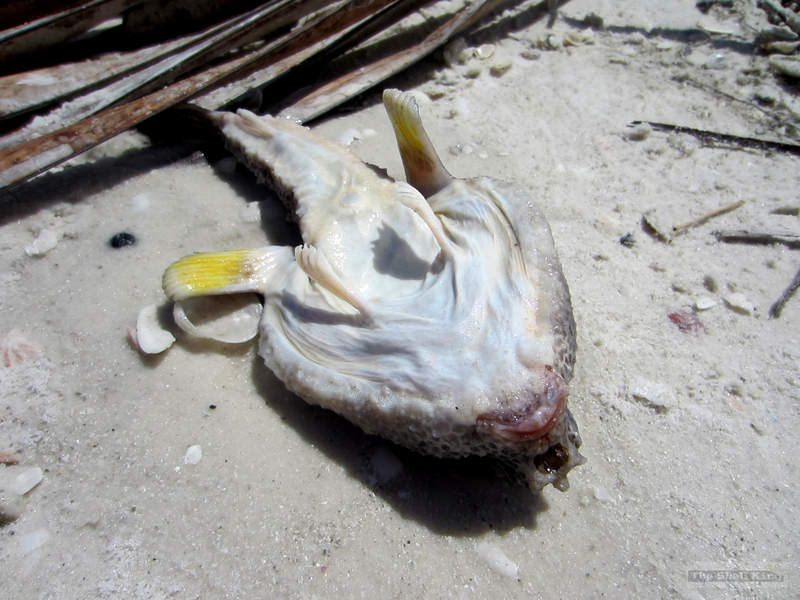 Surprisingly we were able to find a handful of those, along with many Rough Scallops – foot completely intact – including a nice orange one (sorry, I didn’t get to the pics last night). 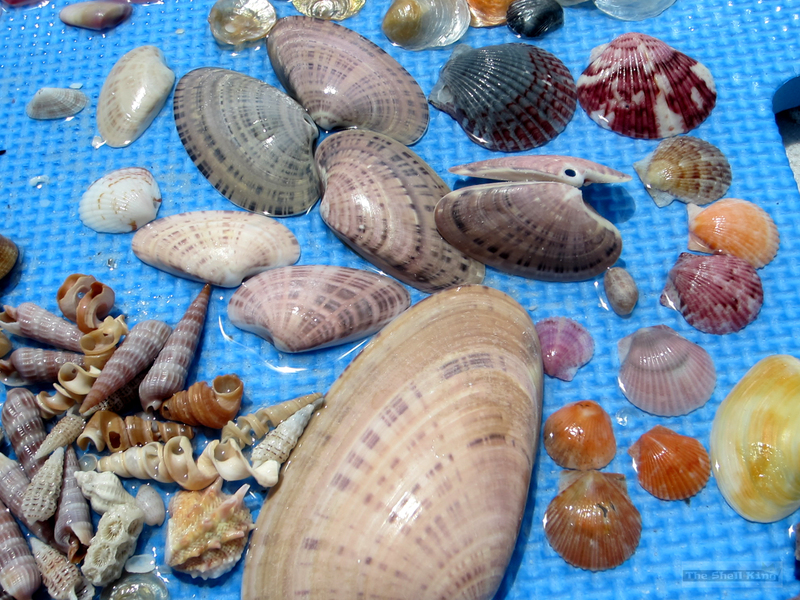 The shells were certainly rolling in – problem was the water. It was as I said, very rough. It was also a light brown color, so you really couldn’t see through it. 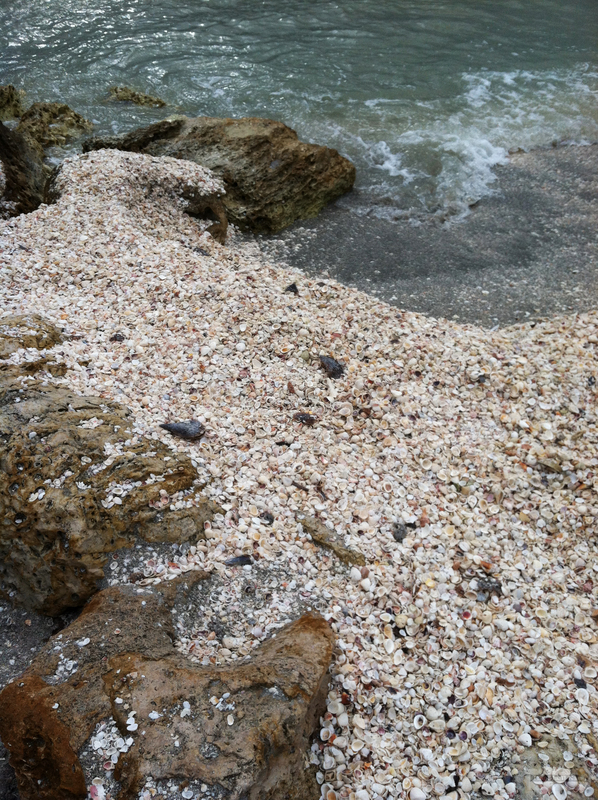 There was a “mini shell carpet” in spots – mostly Arks, Cockles, Quahogs and Pen Shells. However, there were keepers in there. I could see em. I just couldn’t get to em fast enough. 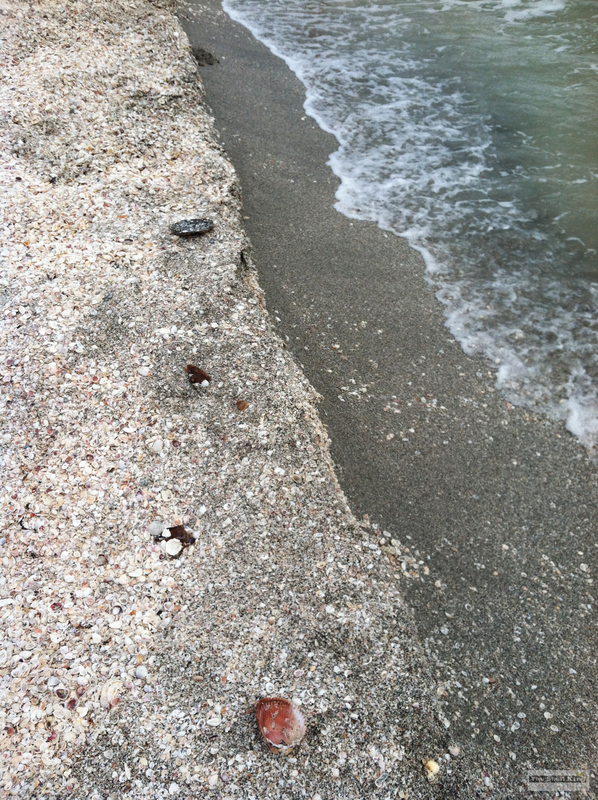 The water would recede and I’d have approximately 1.67 seconds to scan it before another wave would come crashing in. 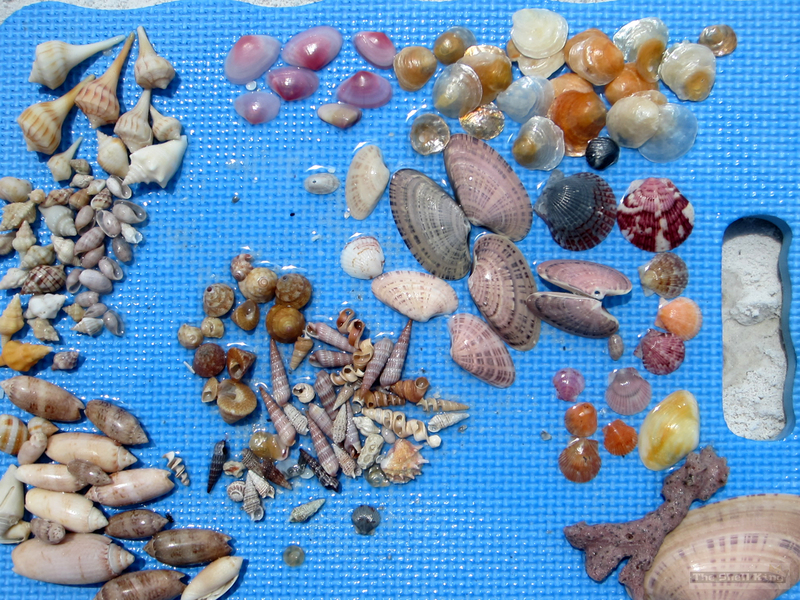 So, I tried the scoop, raking in piles of shells and finding the occasional nice one. 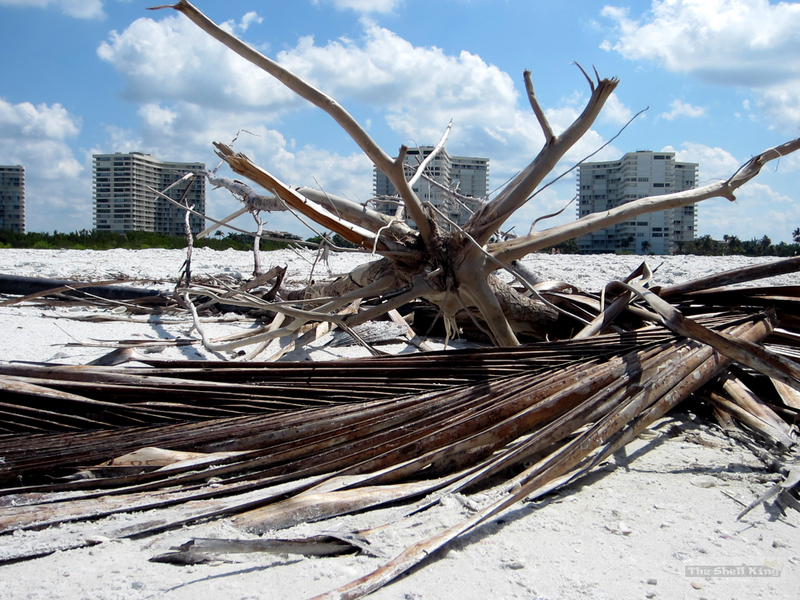 But it was like finding a needle in a haystack full of toothpicks. Not good. 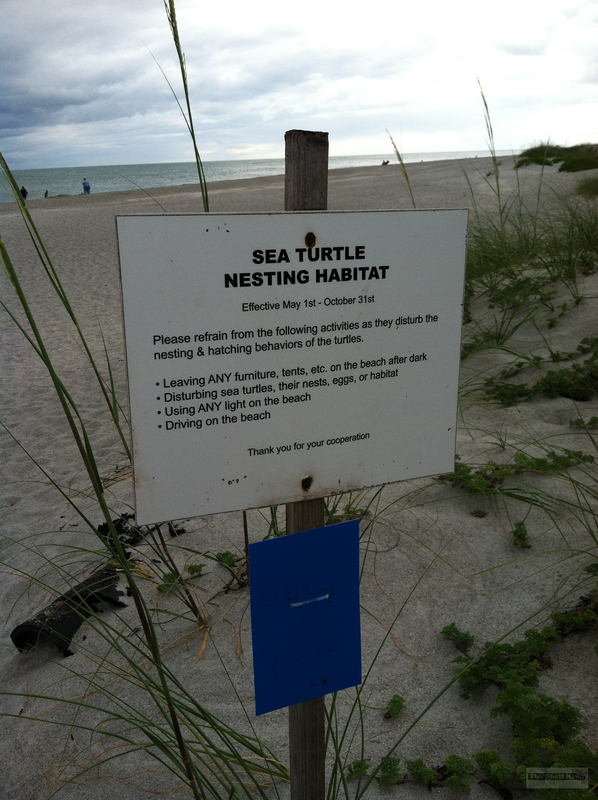 But the toitles are out and momma toitles are makin’ nests and tracks in the sand. So please pay attention to the signs. I chuckled at the last line. But they mention that there because someone has obviously tried it. 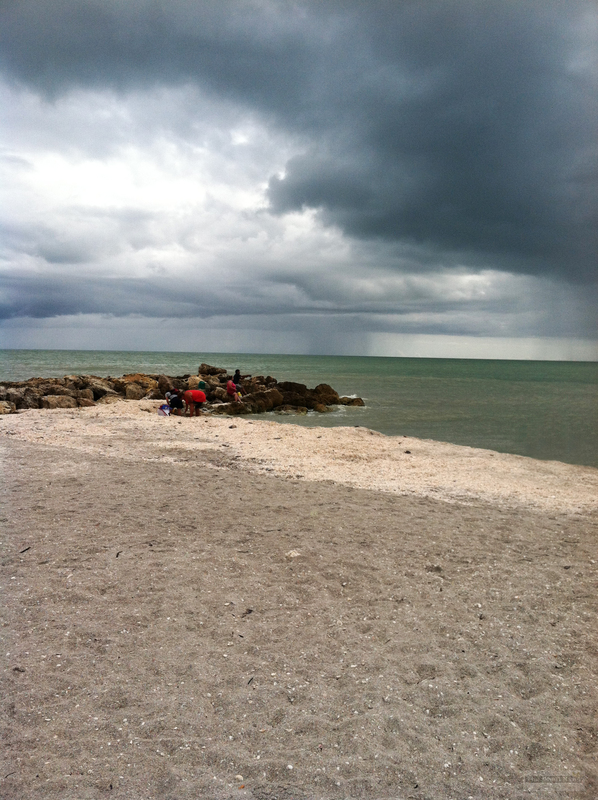 So we headed to the Sanibel side hoping to change our luck. We headed under the bridge to find more of the same. 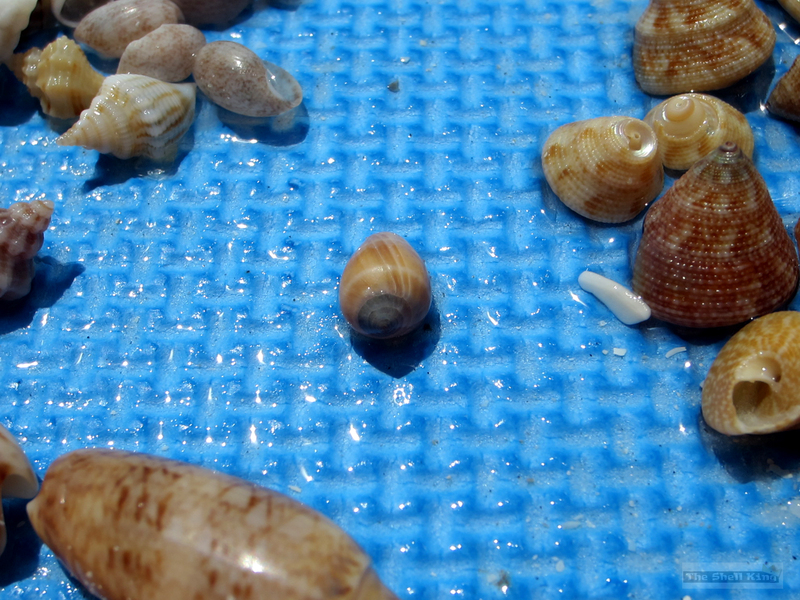 A couple of small Lightning Whelks was all we could muster. 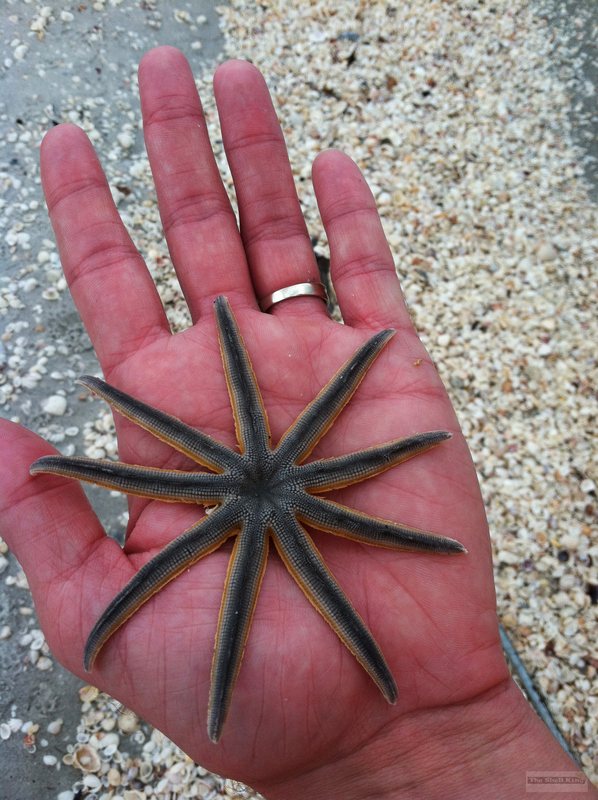 Up the way, the wrack shelf was a little more giving on that side, where we found this Nine-Armed Sea Star. I picked him up to see if he was still alive – yep, but barely. So he had to go back into the deep blue (or in yesterday’s case – light brown). A few more searches of the line and shore yielded very little. 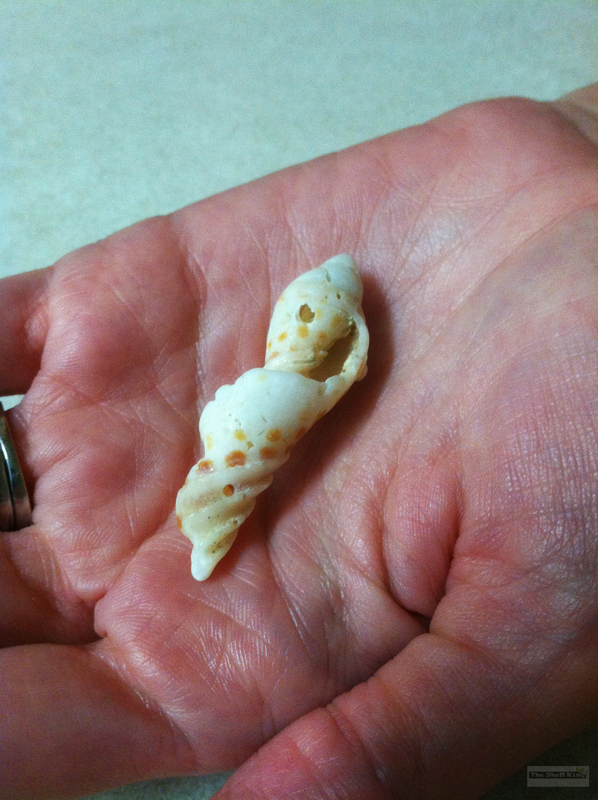 But Queenie found a nice piece of Junonia. A little worse for wear, but a Big J never the less. 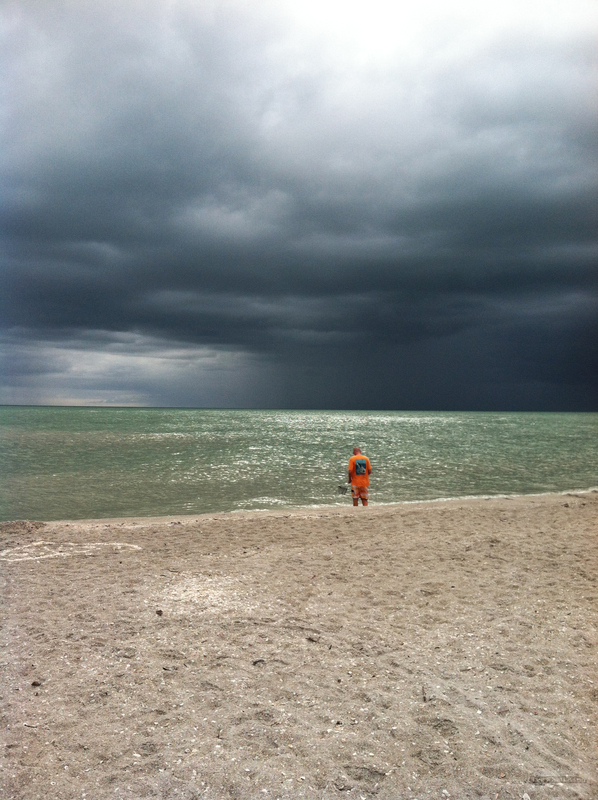 Then the Thunder literally rolled and we got off the beach before my scoop became a lightning rod. Not a great shelling night. But look, Queenie got a new pedicure and flip flops. 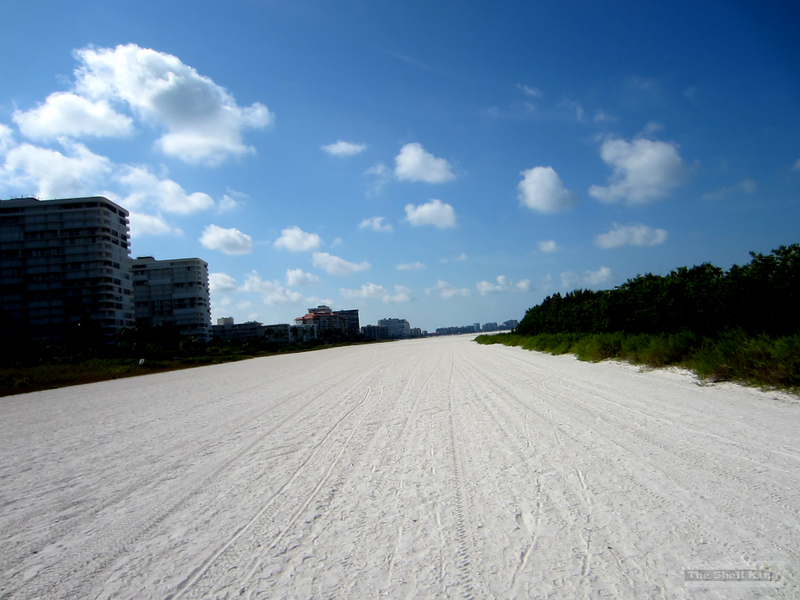 This month’s tour took us to yet another beach we hadn’t visited yet – Tigertail Beach in Marco Island, Florida, located at 400 Hernando Drive. 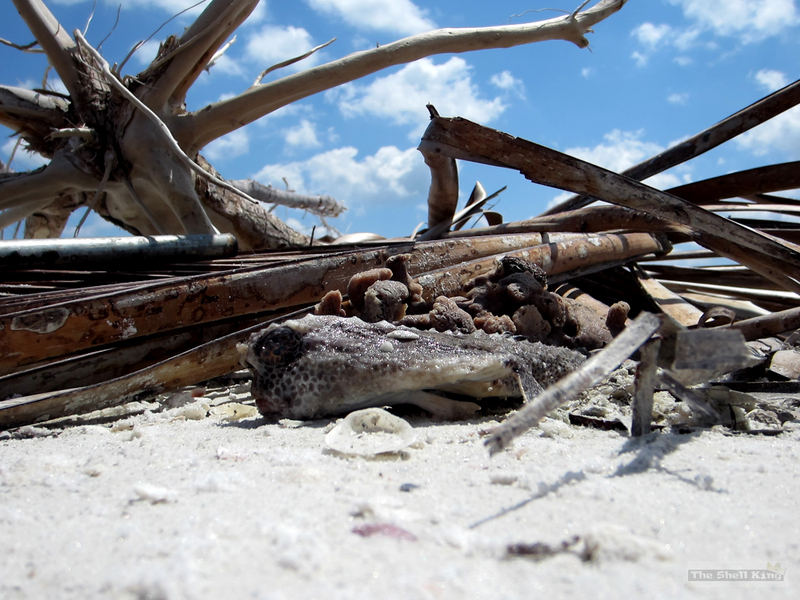 It was hot when we got to TTB – around 90 degrees. 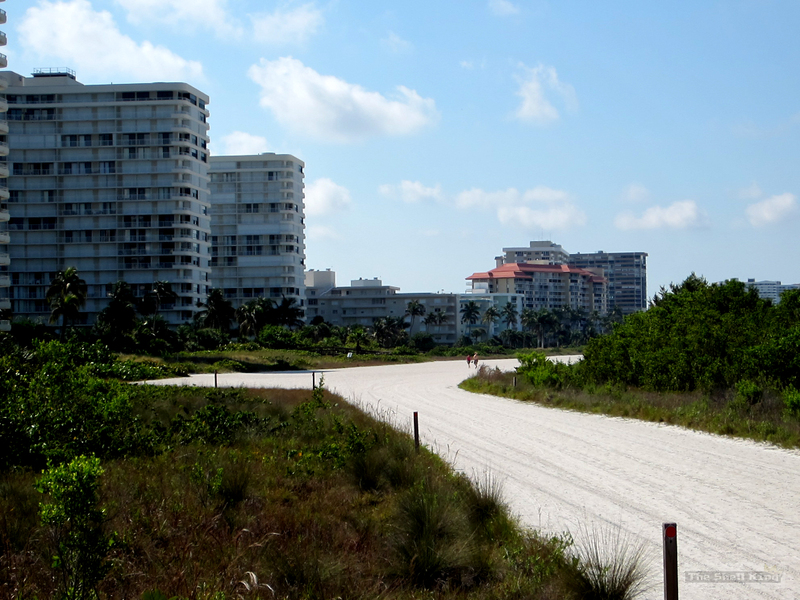 We didn’t realize that the walk to the beach itself would be an adventure of its own. It is $8 to park for the entire day and there are three parking lots to choose from. The Queen and I went to the one furthest South. Upon leaving the parking lot, there is a pathway that stretches down to a T in the road. 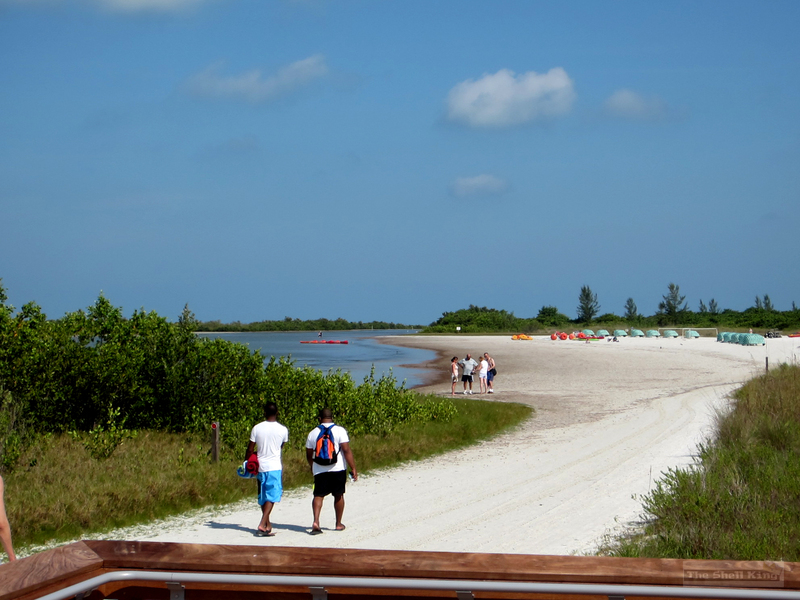 To the right (pictured above), there is a shallow lagoon. You can walk/wade across the lagoon in a specific spot to take you to the North part of TTB. We decided to go to the left. I cannot emphasize this enough – that is a LONG walk. Remember how I’ve said in the past how much I despise the long walk at Bowman’s Beach? Yeah, well multiply this one by two. 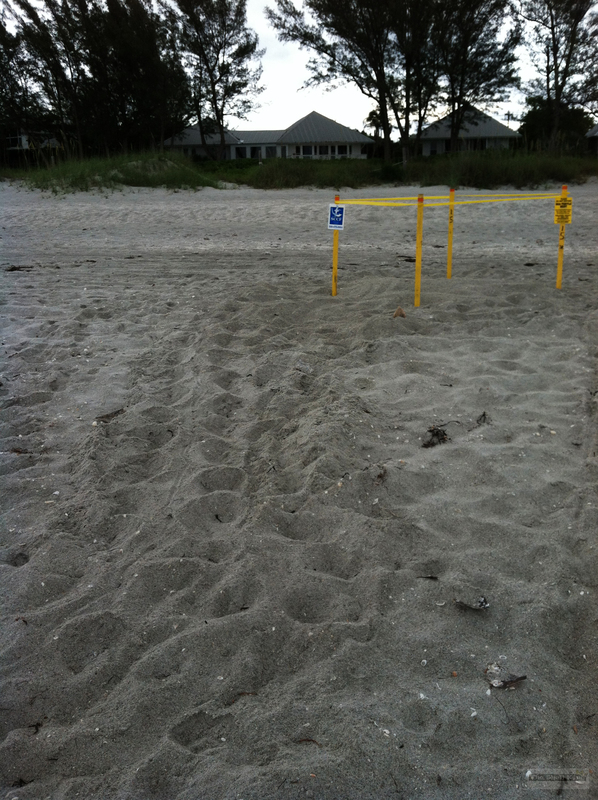 Once you get to the end of the line shown in the picture above, you’re halfway to the beach. In total, it’s about a 10 minute walk. Now I’m not complaining, really. We’re both in pretty decent shape. But it was 90 degrees outside and we were loaded with our essentials. By the time we got to the shore, we were both huffin’ and puffin’. But once we set up shop, it was on. 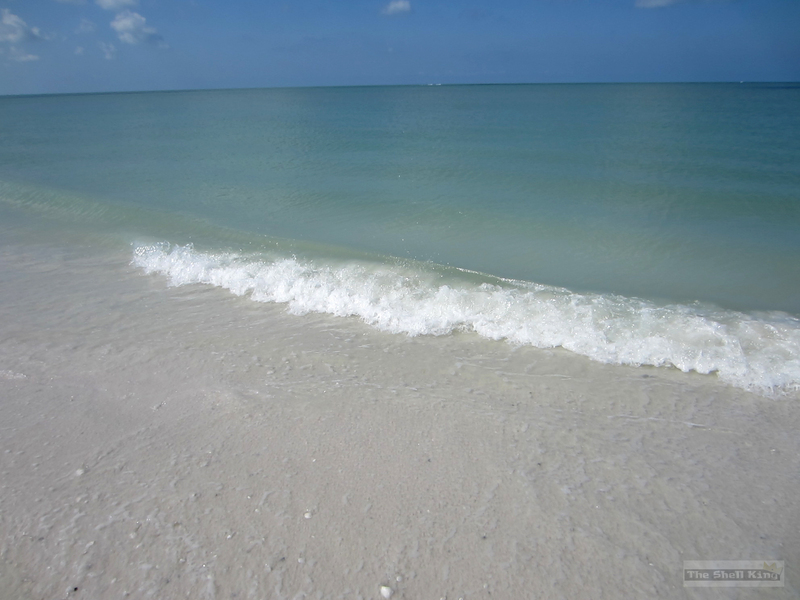 It is a gorgeous beach without question. 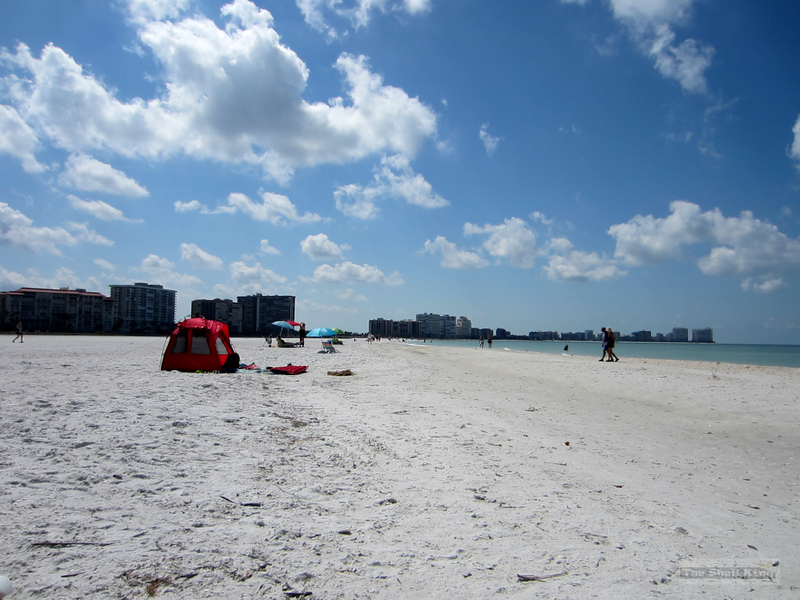 The sand is white and sugary, the water was warm (not as clear as I’d hoped) and the view was amazing. Were it not for the blazing heat and lack of breeze, I imagine we’d have stayed the entire day. So as always, I immediately grabbed the scoop and hit the shore. That’s where the fun began. 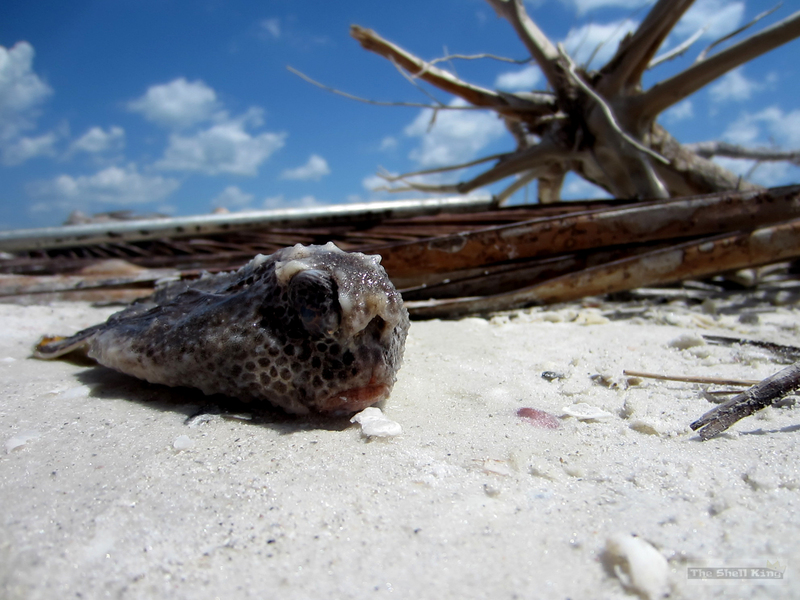 After shelling for an hour and a half, we decided to walk North and explore, where we found this Polka Dot Batfish who had met his demise. That’s a creepy lookin’ fish. Despite the long walk to the beach, this is one that immediately shot to the top of my favorite beach list. No doubt the Queen and I will return soon. 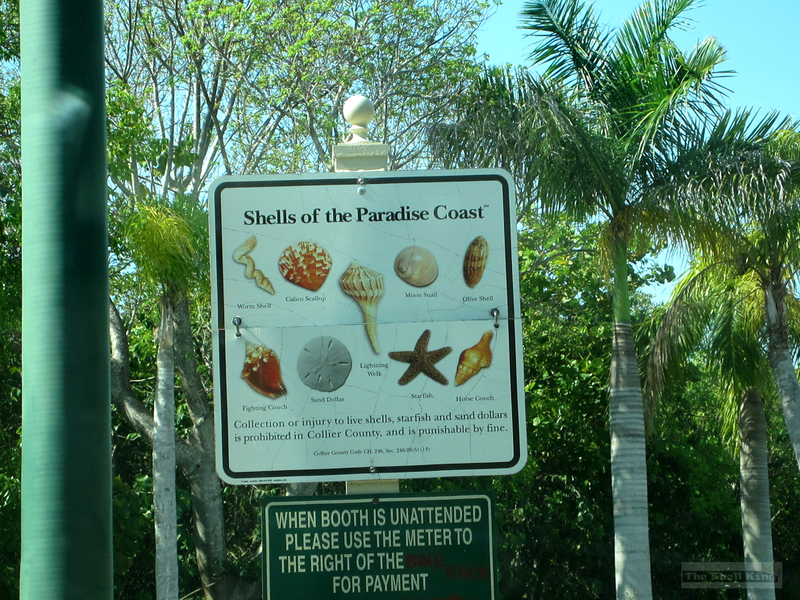 It is certainly a shelling hot spot. 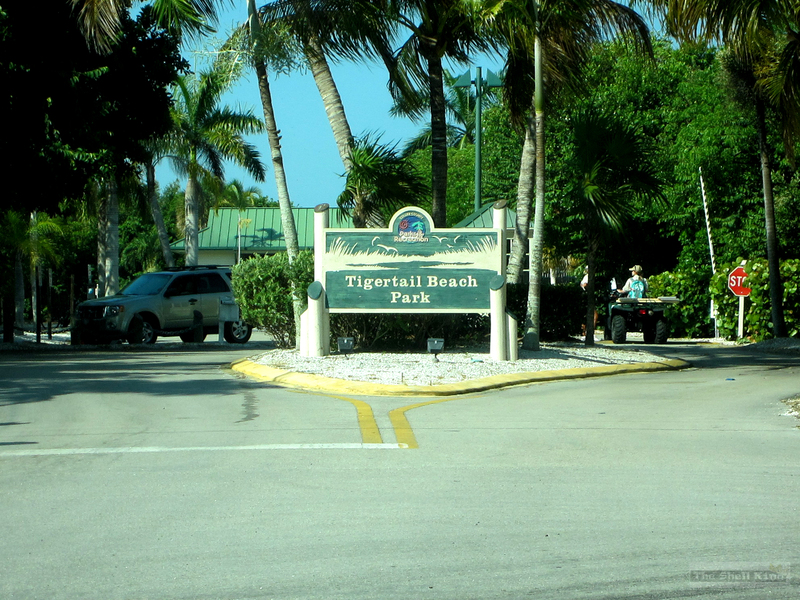 So we recommend you make the trip to Marco Island and stop at Tigertail Beach for the day. 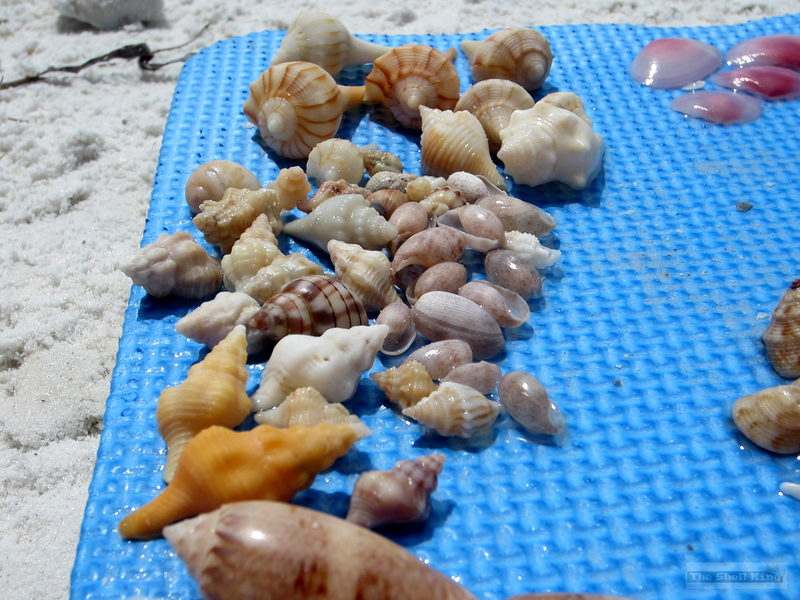 You’ll love the sand, you’ll love the view and you’ll certainly love the shells.